One of our most beautiful shrubs at the moment, Ligustrum japonicum, is still covered with clusters of deep purple berries. Its glossy, deep green leaves look as hardy and healthy as they did all summer long. There is nothing about this shrub which even hints at the freezing days and nights we survived last week. Mature Ligustrum shrubs, actually small evergreen trees, make a thick windbreak hedge along one side of our property. Unremarkable through most of the year, they fade into the background; forming a living privacy fence. Extremely hardy and self-sufficient, they require no particular care. They tolerate drought, sun or partial shade, and can grow in a variety of soil types. The deer leave these shrubs alone. These beautiful berries attract many hungry song birds throughout the winter. Although many have already dropped or been eaten, there are plenty to feed our birds over the next several weeks of winter. They just quietly grow larger each year, covering themselves with fragrant white flowers each spring. We never prune or trim the Ligustrum on the property boundary, although we have pruned one closer to the house fairly heavily, to keep it in bounds. It thanks us with abundant new growth and a heavy crop of berries. Evergreen Japanese Ligustrum has naturalized nicely in coastal Virginia. 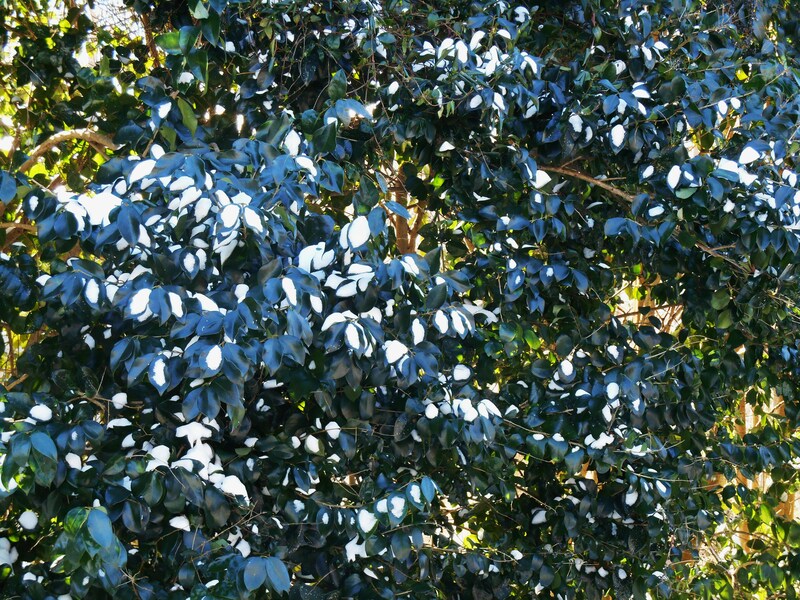 Although a “nursery shrub”, also known as “Japanese Privet,” it seeds itself far and wide. Considered an invasive species in some areas, it is one of those work horse shrubs of the suburban landscape. There are gardeners who despise this shrub, mostly because of its heavy berry crop. You will find little volunteer shrubs in early summer, and must either pull them or work them into the landscape plan where there is room for them to grow. This photo, taken during the deep freeze last week, shows the evergreen leaves as glossy and green as they were all summer. 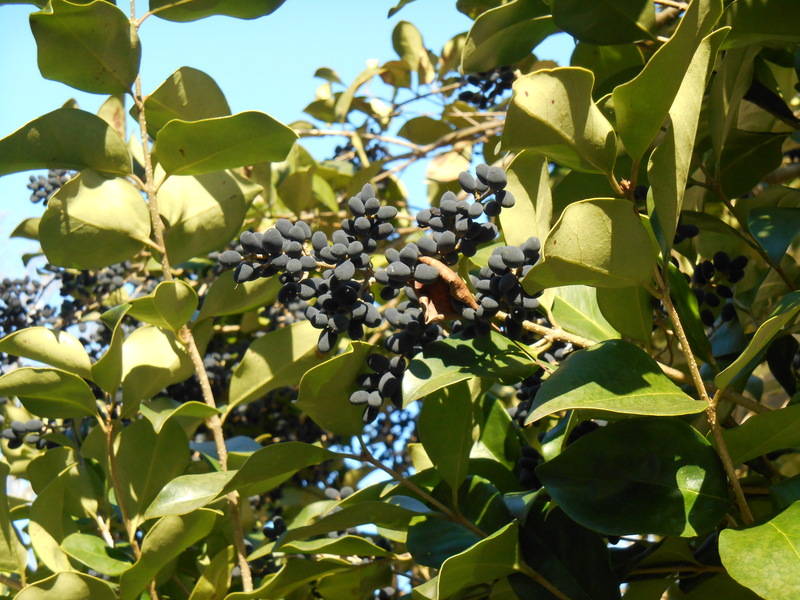 And yet, Ligustrum plays a valuable role in our garden. Not only does it provide privacy, it also filters and cleans the air and muffles sound. It is thickly grown enough to provide plenty of nesting habitat for a variety of birds, and produces abundant berries to feed wildlife in winter. Our shrubs are large and strong enough to also support honeysuckle vines and native grape vines growing through them, which provide additional food and cover for wild life in the garden. 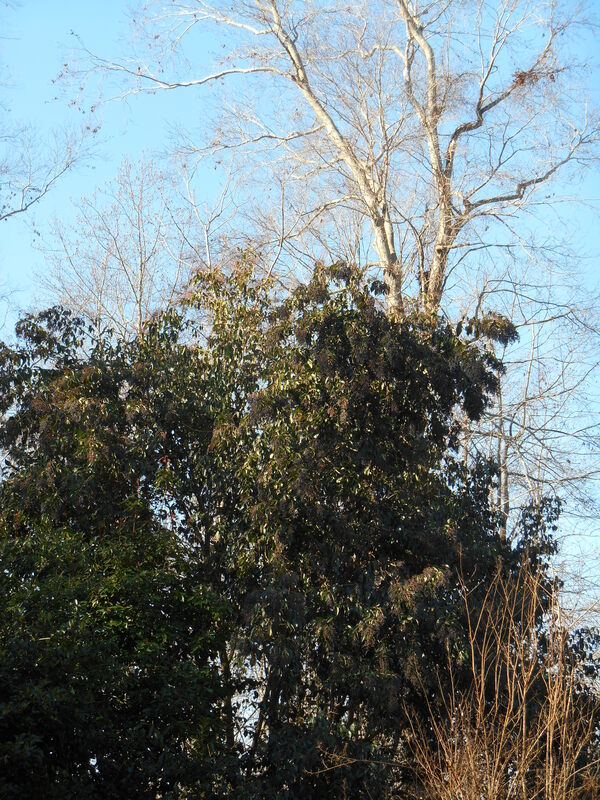 Our Ligustrum shrubs are quite old, and quite high. Actually small trees, they are 20 feet tall, or more, along the edge of the property. I didn’t properly appreciate the Ligustrum when we first moved to this property. In fact, early on I thought about cutting them and replacing them with something “more interesting.” Since I make it a practice to just live with a new garden for a while, and observe through the change of seasons, my opinion of the Ligustrum slowly changed over time. Their heavy spring bloom didn’t make us sneeze, as I had feared. Their blooms are fragrant, and last a long time, well into early summer. The flowers produce abundant pollen. They are an important source of nectar for bees and other insects. 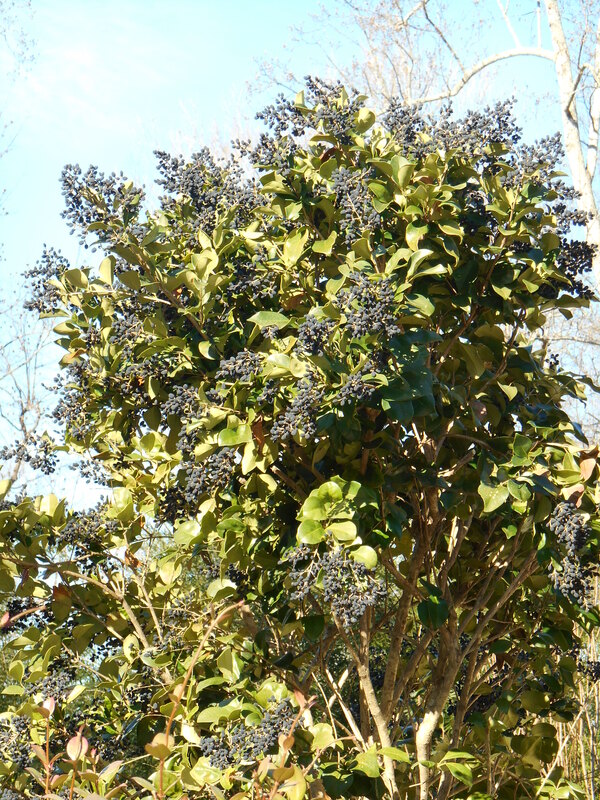 In deep winter, Ligustrum hold their color and glossiness even better than Camellia shrubs. The light they reflect from their large, glossy leaves brightens the landscape when the sun comes out. They maintain the same visual mass they have in summer, since the leaves remain all winter long. We have lost leaves in heavy wind storms, but have never lost so much as a branch from any of the many Ligustrum shrubs on the property. We are on the northern edges of their hardiness zone, as they grow most easily in zones 7-10. 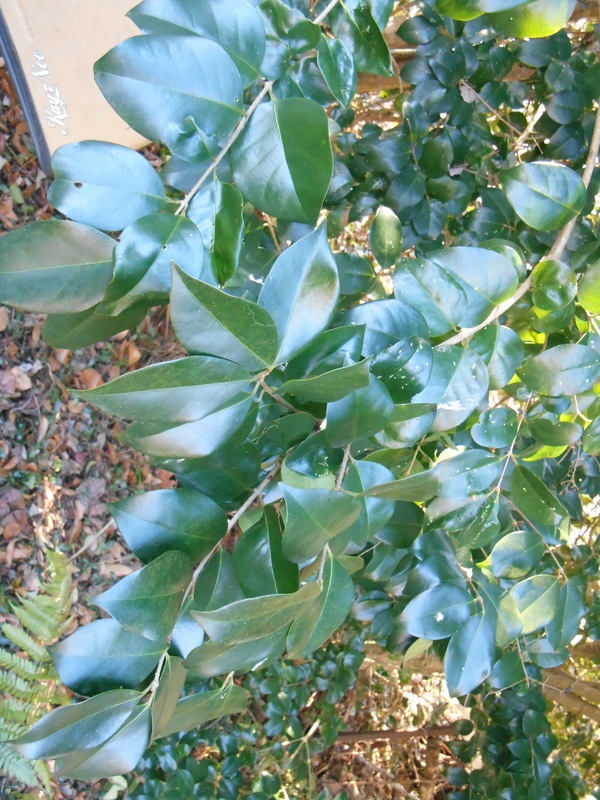 Ranging from Maryland south to Florida, and then along the Gulf coast to Texas; these shrubs are found in the Southeastern region of the United States. So although Ligustrum japonicum is considered an invasive species, and all parts are poisonous for people, I’ve grown to appreciate it in our garden. Heavily pruned, it can be as boring and rangy looking as any of a number of other nursery trade evergreen shrubs overused in suburban plantings. Planted where it can grow freely,and fulfill its potential as a small tree however, it is quite lovely. Our Ligustrum near the house is limbed up, and we enjoy its elegant cluster of curving trunks. Most of our shrubs have branches nearly down to the ground, forming a living green wall screening our drive from our neighbor’s. 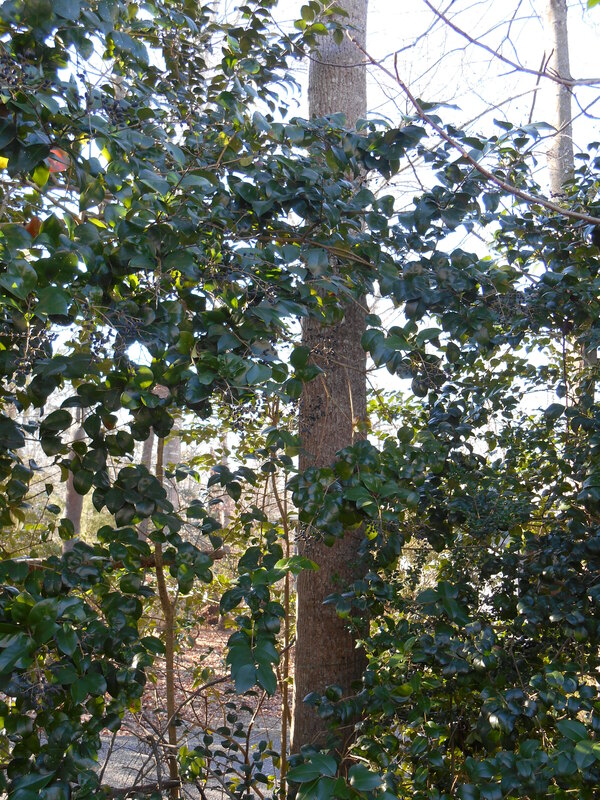 Along with holly, Camellia, pine, and Mountain Laurel, it keeps our winter garden green and vibrant. 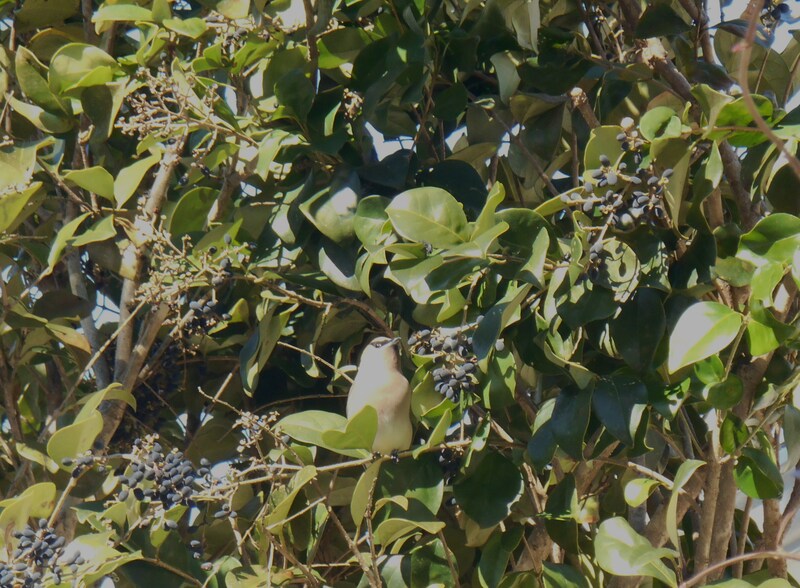 The Ligustrum comes alive with scores of birds feasting on its berries when snow makes much other wild food inaccessible.